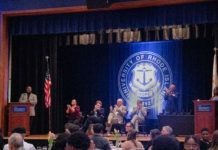 There are many students at the University of Rhode Island who compete for academic excellence. However, few achieve a 4.0 GPA while balancing three jobs and 19 credits, the maximum allowed. Even with the beginning of summer looming, Rachel-Lyn Longo, a junior double major in political science and psychology, holds herself to high standards. She is equally committed to both her many classes and jobs, on and off-campus. Recently, Longo received the 2014 Harold Thewlis Award for Outstanding Achievement in American Government by the Political Science Department. This is a departmental American Government award, which is decided upon by the chair of the department and some of the professors. Longo notes that it is vital to be confident and capable in this competitive world. She demonstrates these qualities in her own life through her work as a paralegal, her previous internship for the Chief Judge of the Rhode Island Family Court and her frequent presence in the courtrooms. After being notified that she had received the prestigious award, Longo felt very much validated in her ongoing efforts. She was then asked if she would attend the legislation session of the House of Representatives at the State House by Representatives Kenneth A. Marshall and Antonio Giarrusso. Though very much camera shy, Longo agreed to be a guest on the house floor because of the positive impact it would have on the social science department. Longo transferred to URI from Suffolk University. She had been very ill with Lyme disease and was undiagnosed for six years. Even with her condition, she stayed committed to Suffolk, where she could have graduated a year early and attended law school sooner because of their fast-paced paralegal program. As her condition progressed, she decided to transfer to URI and declare a political science major. After graduating, most likely a semester early this December, she plans to help her father as a paralegal for his office before continuing on to law school. Her dream is to graduate as a professor of law through Yale’s Juris Doctor program. Longo is very proud of her achievements and believes her level of excellence is attainable for others who have similar dedication.